Yesterday, Verizon reported that it activated 8.8 million smartphones in Q4 2013, a 10% decline from the 9.8 million it activated in Q4 2012. While it declined to break out iPhone activations, we do have some data that could help us gauge the iPhone's sales performance in the US market. The reason for the decline in Verizon's smartphone activations should be clear enough to regular readers. As smartphones have "good enough", replacement cycles have become longer. At the same time, the basis of competition in the market has shifted towards affordability and flexibility, which explains the popularity of T-Mobile's unsubsidized plans. 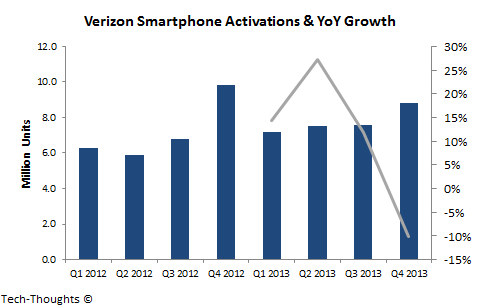 Now, let's make an attempt to gauge how this decline affected iPhone sales at Verizon. Earlier this month, Kantar's survey showed a decline in the iPhone's market share at all major US carriers. Unfortunately, Kantar's survey only covered sales over 3 months ending in November 2013. However, this seems to be the only data point we have access to at the moment. 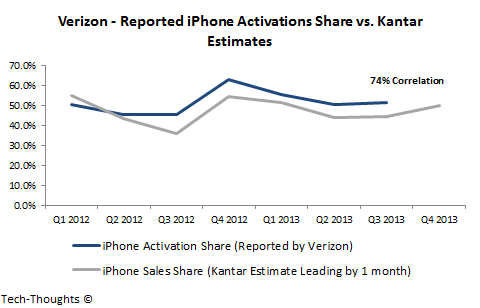 In order to gauge the relevance of this data, I plotted the quarterly iPhone activation share reported by Verizon against Kantar's iPhone sales share estimates at Verizon from the prior month, i.e. Q2 2013 vs. 3 months ending May 2013, Q3 2013 vs. 3 months ending August 2013, etc. The chart below shows the correlation between the two data sets. Both data sets seem to be consistent with each other, without any major outliers. Based on this, Verizon's Q4 2013 iPhone activations should make up roughly 58% of all smartphone activations or 5.1 million units. This is an 18% decline from Q4 2012, when Verizon posted 6.2 million iPhone activations (~63% of all smartphone activations). Based on Kantar's data, the iPhone's consolidated sales share has declined at all other carriers as well, which brings up the possibility of a significant YoY decline in US sales. This is also consistent with data from Google Trends. Even though the iPhone 5S has continued to sell well, sales of lower-end iPhone models may have been pressured because of the change in pricing dynamics. In order for the iPhone to see sales growth in calendar Q4, these declines will need to be offset by growth in Japan (DoCoMo addition) and China (faster roll-out).